We are in the thick of US earnings season now, and next on the list was Google, out after the closing bell on Wall Street last night. The holding company is actually called Alphabet, but the share code is GOOGL, so that's that. 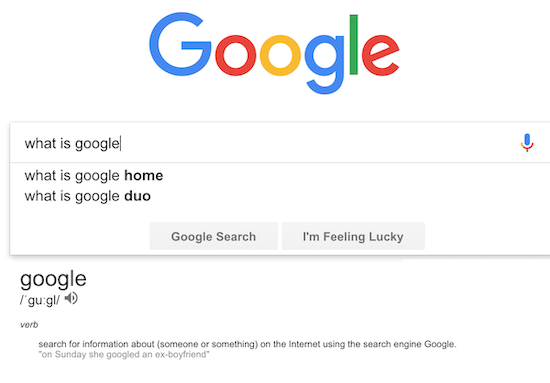 If you type 'what is Google?' into Google, it comes back with the meaning of the word, a verb, to google. In other words, using the company's search engine is synonymous with searching for and finding things on the internet. Also shown high up in those search results are the basic company details. Google is an American multinational technology company that specialises in Internet-related services and products, which include online advertising technologies, search engine, cloud computing, software, and hardware. The CEO is Sundar Pichai (since Oct 2015). It was founded in September 1998 by Larry Page and Sergey Brin. Its headquarters are in Mountain View, California. It also owns YouTube, AdMob, DoubleClick, Android, Gmail and Waymo. Google's (Alphabet) third-quarter sales came in a little light with revenue only up 22 percent, slower than growth in the prior period. However, earnings comfortably topped expectations at $13.06 per share, more than the $10.40 average Street forecast. This remains an astonishingly profitable company. Capital expenditures hit $5.28 billion, up 49 percent from a year earlier. The company is spending billions of dollars a year to build data centres, while chasing Amazon in the cloud, and developing new consumer hardware like its Pixel phones. Google shares dropped 3.95 percent after the results were announced, in after-hours trading. Guidance for the forthcoming quarters looked a little less robust than some expected. Let's see what they do in the session later today. Remember, the stock is up more than 50 percent in last three years. This remains a conviction buy, here at Vestact.